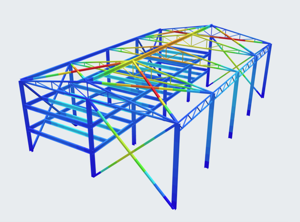 Welcome to our free Reinforced Beam Section Calculator. This powerful tool can caclulate the shear and bending strength (or capacity) of a wide range of Beam Sections. It is an extremely fast and accurate way to check your results or possibly calculate initial dimensions of your beam section by trial and erroring a number of different section combinations. This concrete beam calculator will calculate for the design capacity for i beam (lvl), t beam and rectangle sections with reinforcement. The Reinforcement Beam Section Calculator is a failry simple tool, and is small part of our fully featured Reinforced Concrete Beam Design software offered by SkyCiv. This software will display the full report and worked example of reinforced concrete design calculations as per ACI, AS and Eurocode design standards. These results include moment capacity checks, shear checks, detailing and axial requirements. The full version also allows users to add more layers of rebar (including top layers) as well as shear stirrups. Like our other calculators, this reinforced concrete Beam Capacity Calculator is very easy to use. Start simply by entering "Add/edit Section" to add the main beam section. Once this is complete, you will need to add the steel reinforcement bars (or similar) by clicking the "Add/Edit Steel Reinforcement." There is also a Settings button so you can edit the parameters used by the calculator, such as rebar and concrete strength. Use the provided diagram below as a guide to the dimensions for the section. This rebar Calculator (aka composite calculator) is currently in BETA testing so please leave any feedback or bugs in the below comment section. Get more features at our full Reinforced Concrete Design Software based on design codes ACI 318, AS 3600 and Eurocode 2. Centroid (X) = Distance from the furthest left of the beam section to the section's centroid. Centroid (Y) = Distance from the bottom of the beam section to the section's centroid. Many thanks to this share!! THIS IS A GREAT WORK !, INDEED, ANY ORDINARY FOLKS, ENGINEERS OR NON-ENGINEERS CAN MAKE USE OF THIS SOFTWARE PROGRAM CALCULATOR (BETA) TO CHECK, VERIFY AND SIMULATE HIS/HER CONCEPTUAL DESIGN WORKS FOR ANY STEEL REINFORCED CONCRETE HOUSE OR APARTMENT’S SECTIONAL MEMBER SUCH AS RECTANGULAR, I-BEAM, ETC. SHAPED HORIZONTAL BEAMS. HOWEVER, I WANT TO SUGGEST THAT THE AUTHOR SHOULD INCLUDE THE CALCULATION FOR THE STRUCTURAL COLUMN WITH SAME FEATURED SHAPE CHOICES TO COMPLETELY SATISFY ALL USERS AND NOT JUST THE BEAM AND MAKE THIS SOFTWARE COMPREHENSVE AND MORE VERSATILE. THANK YOU, SHOKRAN KATIR, SALAMAT PO ! Please advise me of what “a2″ represents. It is mentioned in the settings ” the last line. I notice that we are able no have some good info, but what about if instead of having just bars on the bottom, we could have them like the image shows, two on the bottom and two on the top, that’s the way I see in most of the concrete beams. Hope that I helped in any way, see ya.